The internet has recently been flooded with recipes and information about bone broth. At first, to be honest, I was quite disgusted with this idea. The thought of eating a bowl of clear soup filled with animal bones sounded a little too prehistoric for me. However, I have a sister who researches and uses alternative medicines and natural forms of healing for the body. Over the holiday she made a big pot of bone soup, and I think my husband and I ate the whole thing. I even ate it for breakfast. Once upon a time, bone broth was a part of nearly every meal in this country. It primarily served as a base for soups, gravies, and stews. Unfortunately, grocery stores have caused a declining need for a corner store butcher. This means preparing homemade broth from scratch has become a lost art. Currently, there seems to be an upswing of the nutrient rich broth. Some people call it a magic elixir because — among other attribute — bone broth promotes healthy joints. The concoction also keeps your gut healthy because the gelatin in bone broth plugs the excess holes in the lining, which helps those who suffer with leaking gut issues. 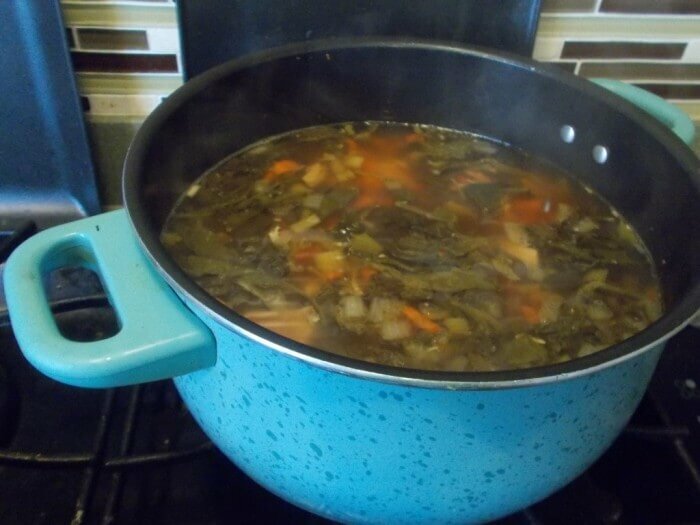 The soup also aids in detoxifying the liver. 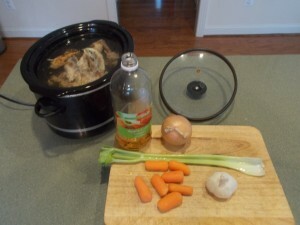 I would like to share my bone broth recipe with you. Try it, I promise it is way better than you think it could be. Start by cooking or boiling a full chicken. If you boil the whole chicken, spoon out the frothy stuff. “Broth-ers” call that fluffy looking white substance the toxins, which is what you are trying to get rid of by drinking the broth. You could also use beef bones — really any bones would work. Once you have a pretty clean carcass, or collection of bones, put them in the crock pot and add an entire clove of chopped garlic. The garlic not only flavors the broth, it helps keep you healthy during flu season. Then toss in some veggies like roughly chopped celery, onions, carrots, and asparagus if you have them. Add a tablespoon of apple cider vinegar, or lemon juice, and some rosemary. I do not have a specific measurement for the rosemary, I just strip a couple springs and toss them in the pot. Fill the crockpot with water. You can throw the chicken skin into the pot also, if you like. I usually just throw the skin away, so I am not sure how it will impact the process or flavor. Some say chicken feet are packed with nutritional goodness, but by the time the chicken gets to my grocery store, it is footless and I have not gotten around to buying them separately. Let all that simmer/cook on low for about 24-to- 48 hours. Then strain out all the stuff so you are only left with broth. At this point you can be done-enjoy! However, I like to pour the broth back into the crockpot with some diced onions, celery, carrots, and a couple cloves of garlic. I also add cooked, dark meat chicken and some greens. Let it simmer until the greens are wilted. To serve, my husband and I like to toss in a little Tabasco sauce to taste. Nikki Phillips grew up in Northern Maryland, but moved to Calvert County after college. Her husband grew up in this area and they are raising our two children in Calvert County. She is eager to share information about the safe, fun, family based activities in the county. She enjoys running, cooking, reading and spending time with my family exploring the area.